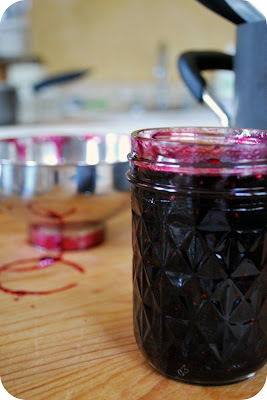 Another jam recipe for you. 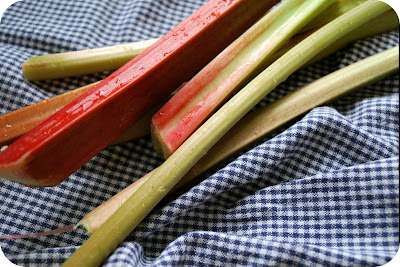 This one was the original inspiration for all this jam-making craziness. 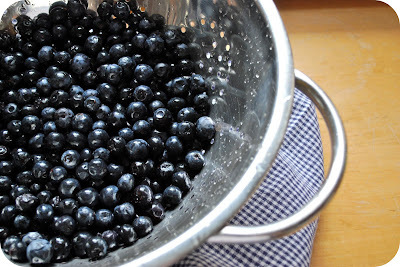 I mean, I love blueberry anything any day of the week--but when you add the tart goodness of rhubarb, well, I will admit that I actually hoarded the blubarb jam we bought from the farmer's market last summer, declaring it off-limits for everyone but me, me, me. 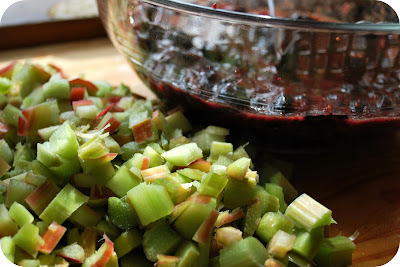 So, here I am this year, making enough blubarb jam that I can afford to feel more generous with it and set a better example as a human being to my son. Because sharing is important, you know. I love this jam especially on fresh, eggy popovers. But it also happens to be extraordinary on everything else you would put jam on...and I want to try it on poultry too since last year I had some sort of duck when I was in Maine and it had a blueberry sauce on it and it was so good I was almost born again. People have been known to get religion over lesser things than blubarb jam , you know, so don't laugh. And remember that if something goes woefully awry, you can always find my runny jam cure right here. Thanks for this recipe! 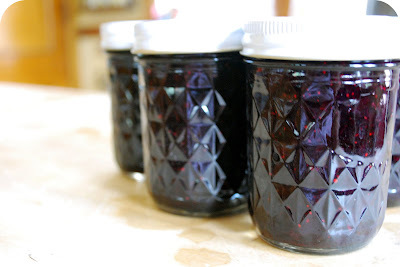 My Grandma used to make this jam all the time, and I just found her recipe a couple weeks ago and have been meaning to make some. Oh my! Where did you get those jars from?! I am re-downloading this recipe and just realized that you wanted a peek at my Grandma's recipe - I never saw this comment! So sorry. My mom has it - I will try to get it for you so you can compare [I never did make it last summer, sigh].